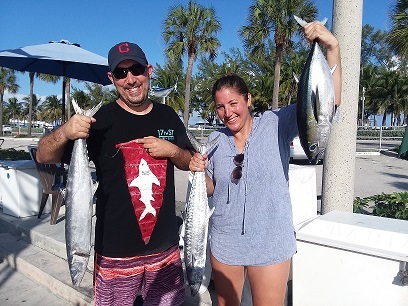 Keith and Julie Helmer chartered the Top Shot Sportfishing charter boat team to do some deep-sea charter boat sport fishing in Fort Lauderdale, FL. Fifteen to twenty minutes after leaving the dock, lines were in 120 ft. of water by the sea buoy in Fort Lauderdale, 1.8 miles from shore. We started the afternoon trolling using two deep lines with a double hooked Bonito strip with a sea witch in front and 3 surface lines with Ballyhoos. We trolled from 100 feet of water out to 300 feet of water heading to the south of Fort Lauderdale and offshore. There were a lot of sargassum weeds in the water, and we kept out of the major areas of weed. We fished up the current edge and back over the reef, avoiding the scattered weeds as best we could and looking for birds and baitfish, since with all the seaweed, there were a lot of flying fish. We got our first bite in 130 ft. of water, which was a 10 lb Kingfish. We kept on trolling, catching another 9 lb Kingfish. The next two fish we caught were Black Fin Tunas, which we got on the 3 inch blue reflector drone spoon. We were trolling over wrecks and rock piles along the reef line - the best area with the most action was in 150 ft. of water. Next, we got a bite on the surface rigger line, and it was a Black Fin Tuna. We totaled 3 Kingfish, 1 Skip Jack and 6 Black Fin Tunas. Keith wanted to catch something big, so we tried going for a Shark. We put out two Shark baits, one midrange and one on the bottom. After a few drifts with no luck, we moved on to another wreck. Using a live bait, we tried again, but we didn't get a bite. Next, we decided to try another area close to a wreck in 150 feet of water with two baits close to the bottom up current of the ship. All of a sudden we got a huge bite. The rod bent over with drag zipping out. Fish on!!! Keith was the angler, and he got on the rod and started fighting this giant Shark. After a solid battle, we had this Bull Shark up along the side the boat. 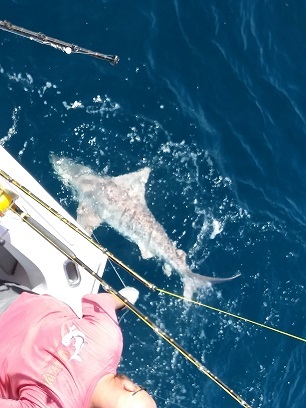 Our mate, Joe, removed the circle hook and released this awesome Shark.